The Padcaster Starter Kit for 11" iPad Pro is designed for users that need a portable and rugged kit for broadcasting tasks. With a plethora of included accessories, the Padcaster Starter Kit allows you to turn your iPad into a professional all-in-one production module. 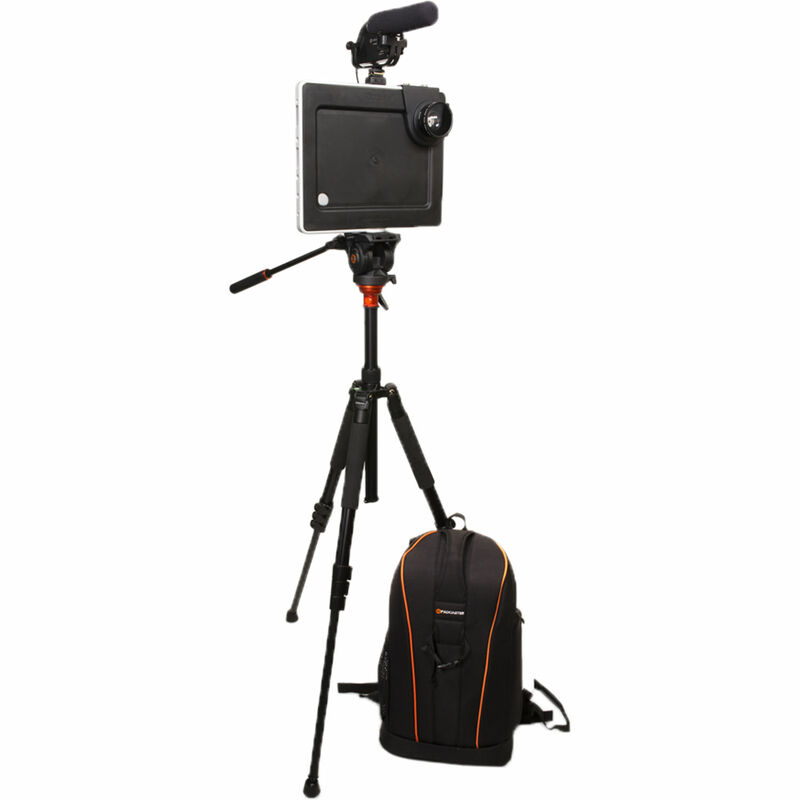 This kit comes with a protective Padcaster Case, a unidirectional microphone kit, and audio splitter. Inside you'll also find a .45x wide angle lens and a fluid head tripod/monopod duo for an immersive and balanced video. Additionally, you'll find a padded backpack to keep your iPad and accessories safe. Case for iPad Pro 11"
Listen and record with the Dual Mic/Headphone Jack from the Padcaster. This Y-splitter has a 3.5mm TRRS male connector on one end and female 3.5mm microphone and headphone connectors on the other, enabling you to record and monitor simultaneously. Expand your field of view with a Wide-Angle Lens from the Padcaster. This 0.45x lens attaches to your Padcaster's lens bracket with its 58mm thread. It accepts 62mm filters and the front of the lens unscrews, leaving a macro lens for close-up photography. Rugged and portable, the Fluid Head Tripod/Monopod from Padcaster is designed for use with their iPad line, Smartphone Verse products, and most anything else with a camera. Built using aluminum, it can endure a wide range of shooting situations and its back-folding legs make it compact enough to clip onto your backpack. Featuring a fluid pan and tilt head that can support up to 13.2 pounds, your devices will be secure and balanced. There are also two ball-level adjustments to help ensure your shots are horizontally and vertically level, even if the ground beneath you isn't. With three leg sections and a telescoping center column, the Padcaster Fluid Head Tripod/Monopod can extend to 71" and folds down to 22" for compact travel and storage. If you're looking for even more of an on-the-go solution, unscrew one of the tripod legs and attach it to the removable center column to create a monopod. Additional features include a 3/8"-16 accessory interface to mount other equipment, removable spike feet for improved stability and grip while shooting outdoors, a spring-loaded hook to add extra weight for greater stability, a spare 3/8"-16 screw pre-mounted in the tripod head, and a weatherproof zipper carry bag for added protection against the elements. Carry your mobile media gear on the go with the Padcaster Backpack. This bag is made from rugged, water-resistant nylon and is fully padded to keep your gear safe. Inside, five hook-and-loop dividers let you configure the interior as you like it, and the removable zipper pouch gives you another option for internal storage. An exterior pocket can be found on one side and a mesh water bottle holder on the other, and the back sports a clip for attaching your tripod. An elastic rain cover is included for further protection. Box Dimensions (LxWxH) 3.4 x 2.3 x 0.3"
Box Dimensions (LxWxH) 4.8 x 4.4 x 4.4"
Box Dimensions (LxWxH) 24.0 x 6.0 x 5.0"
Box Dimensions (LxWxH) 19.1 x 10.7 x 6.1"